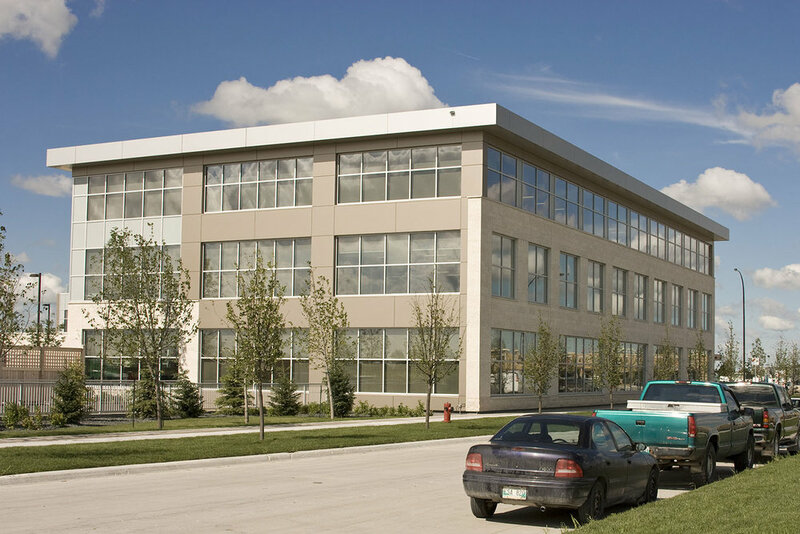 Qualico Winnipeg | prairie architects inc. The Qualico Head Office building is the anchor for their own new Sage Creek Village residential development and defines a new corporate vision for the company. Highly visible from Lagimodiere and Bishop Grandin in the southeast sector of the city and with a commanding corner site that overlooks the adjacent neighbourhood storm retention lakes, this office building provides a unique opportunity to set the tone for future development in a new suburban community, as well as become a collective home base for a diverse, rapidly expanding staff. These objectives provide challenging opportunities for a more comprehensive community. The character and nature of this building is critical to defining the concept for the development – an urban, vibrant office building, neighboured by adjacent shops and cafès on a contemporary small town ‘prairie’ main street. Targeted for a LEED certified level, and achieving LEED Silver, this building demonstrates Qualico’s corporate commitment to sustainability. It is an office building where better indoor air quality leads to fewer sick days and increased productivity. In addition to an energy efficient geo-thermal heating and cooling system and a thermal mass precast concrete structure, this building is designed for solar orientation and to maximize daylight on the south and east, while limiting exposure on the west and north sides. In keeping with a small town setting, the building rises only three stories above grade with a total floor area of approximately 66,000 square feet, not including 1 level of underground parking. Regional plantings at the ground level and on the green roof areas are selected specifically for the prairie climate and to reduce water use and maintenance. On a larger scale, this project represents an exciting opportunity to create a beginning for a more sustainable environment where it really is possible to live and work in one community.